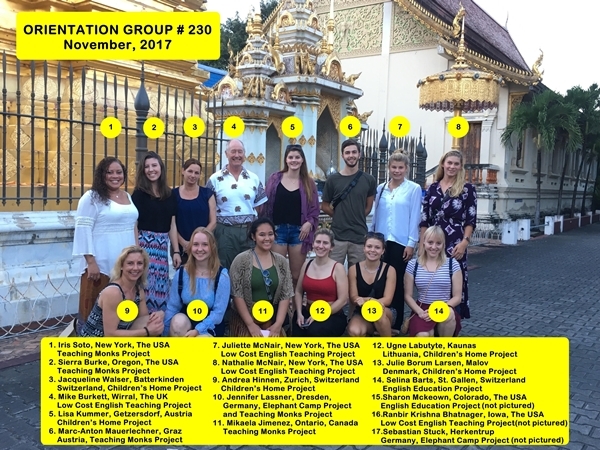 Presenting Chiang Mai Volunteer and Intern Group #230! Early November signals the re-opening of the schools after the Thailand mid-school year break. It’s really a lovely time of year, as the rains have stopped, and cooler, more comfortable weather is upon us. This group of 17 new volunteers and interns arrived a week and a half ago. Their arrival day (Friday, the 3rd of November) was also the main day of celebration for the Loy Krathong festival. They got to make krathongs with our coordinating staff, and observe the customs of this lovely, cultural celebration of life. In this group of 17 volunteers and interns, are participants from the USA, Switzerland, the UK, Austria, Canada, Germany, Lithuania, and Denmark. They are participating in our Teaching Monks, Children’s Home, Low-Cost / Rural Schools, English Education and Elephant Camp Volunteer Projects. For more info on our Thailand volunteer and intern placements, please visit our Thailand Projects Page. Also in this group are three returning volunteers. Ranbir and Mike have returned for their second placement, and Sharon for her third!